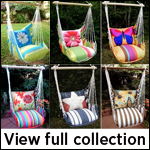 This creative collection of swinging hammock chairs is perfect for anyone looking for a flower, bird or butterfly design to relax and spend the day in. The colors in this collection coordinate well with beige and feature bright hues of purple, blue, yellow and red in a style that mixes modern comfort with an ancient bohemian lifestyle. Ultra-comfortable cushions are created from weather and mildew resistant polyester that won't fade and are machine washable. Each swing supports 250 pounds with the help of a strong wooden spreader bar constructed of Chilean pine that measures 33 inches. Sit and relax in a comfortable swing as you read a book or observe the natural surroundings of your environment. 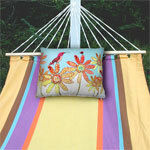 This swing makes a perfect gift for anyone who enjoys relaxing in the outdoors.